Arts Alive’s invites you to rock, pop or hip hop to the drumbeat of Joburg’s myriad of trending cultures, at this year’s Urban Vibes Concert on 26 September, at Bassline in Newtown. Across 3 music genres, set on 2 stages with 1 goal. City slickers will be vibing to the same pulse, both at the outdoor Newtown Park and the Bassline as local and international live bands, hip acts and DJs fire up the stages. The line-up includes rap prince Kwesta, Freshly Ground, Tumi, dancehall reggae singer and guitarist Cherine Anderson, Jah Vinci from Jamaica, DJ Cleo, DJ Kenzhero and many others and featuring a host of electrifying live acts. Jah Vinci graces the stage all the way from Kingston Jamaica with his special brand of reggae dancehall. 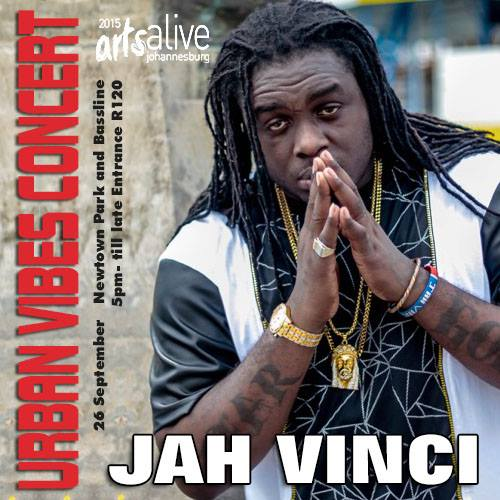 Jah Vinci was born in Kingston, Jamaica and quickly made a name for himself performing at local churches with his impressive vocal range. He was mentored by Vybz Kartel who helped establish his name in the industry. His rose to fame after recording the hit single, “My place a my place” for famed producer, Stephen McGregor. While working with Vybz Kartel, Jah Vinci recorded a slew of hit songs for various producers, namely; “friend from foe” and “remedy for Russian, “please Jah guide me” for Jordon, and “baby girl I’m alone” for TJ. He formed his own record label Outclear Records which is fused with Tripledose Production. Fellow Jamaican songstress Cherine Anderson will also be heating up the Newtown stage with hits like ‘Haffi Come Back’ and the collaborative smash hit ‘Rebel’. The actress/singer is the first Jamaican female artist to hit the Billboard Rock charts featured on the song “Say Hey, I Love You” with Michael Franti & Spearhead. The song simultaneously peaked six Billboard charts and was placed on the soundtrack of numerous films and TV commercials including the EA 2010 FIFA World Cup South Africa Music Soundtrack. She dominated both local and international reggae charts with her single “Shine on Jamaica” from her EP The Introduction-Dubstyle EP. “Shine On Jamaica” peaked at number 1 for four weeks on both the NY Reggae charts and South Florida reggae charts. She is also known for playing the character Serena in the 2003 Jamaican film, One Love and has performed with the likes of Sly and Robbie, Sting, Jimmy Cliff and Michael Franti. The international stars are joined by award winning Freshlyground, a band that needs no introduction for their unique Mzansi flavour that they’ve shared across the world. Award winning band, formed in early 2002, is made up of seven talented and diverse musicians from South Africa, Mozambique and Zimbabwe. Fronted by the diminutive but dynamic Zolani Mahola, the band exudes a live performance energy that has been the bedrock of their success. The band have a slew of hit albums and was selected to co-perform in the Official Song for the 2010 FIFA World Cup titled “Waka Waka” with Shakira. The song has sold well over 3 million singles and reached number #1 on several charts worldwide. The song is the most successful anthem in the history of the FIFA World Cup.The ‘Waka Waka’ hitmakers’ stage presence is unparalleled and will permeate all through Newtown Park as the night progresses. Wordsmiths Kwesta and Tumi (from Tumi and the Volume) and Fifi Cooper represent the spirit of local hip hop with their poetic melodies and lyrical dexterity that’s kept South Africans locked to their infectious sound. DJ Cleo, DJ Kenzhero, DJ Speedsta and DJ C-Dread amongst others will hit the decks throughout the night to make sure the crowds are grooving until the late hours. The concert is the penultimate event of the Arts Alive jam-packed concerts and proceedings over the month of September, celebrating the diverse heritage of local and international music that you won’t want miss out on.